BROWNSVILLE – Until the day she was arrested, 53-year-old Vicenta Verino spent years canvassing poor, elderly and mostly Latino neighborhoods, harvesting mail-in ballots for candidates who paid her to bring in votes. Her crime: unlawful assistance of a voter, an offense that would not have been prevented by the state’s voter ID law. Texas officials claim that the law is needed to prevent fraud, but only 15 cases have been prosecuted by the office of the attorney general of Texas between the 2012 primary election and July of this year, according to a News21 review of more than 360 allegations the office received in that time. Eleven of those 15 are cases are similar to Verino’s, in which “politiqueras” – people hired by local candidates in predominantly Latino communities – collect and mail ballots for mostly elderly local voters. Texas election laws restrict who can have assistance while voting by mail and require a signature on the ballot from the person who assisted the voter. “We used to work street by street seeing people, talking about the candidates, and those times, it kind of used to help the people,” Verino said, now two years after her arrest for voter fraud. Texas’ contested law, passed in 2011, requires voters to present one of seven approved forms of government-issued ID at the polls. In July, the U.S. 5th Circuit Court of Appeals in New Orleans ruled the law violates parts of the Voting Rights Act. For the November election, people without ID will be allowed to vote if they sign a sworn statement. A spokesman for the Texas attorney general said “this case is not over” and the agency is considering an appeal to the U.S. Supreme Court. Texans have not been required, however, to show identification when voting by mail. The only exception is if a voter registers to vote for the first time by mail and does not provide a photo ID number or the last four digits of their Social Security number. Then, local election officials can ask the voter to send a copy of an ID with their mail-in ballot. 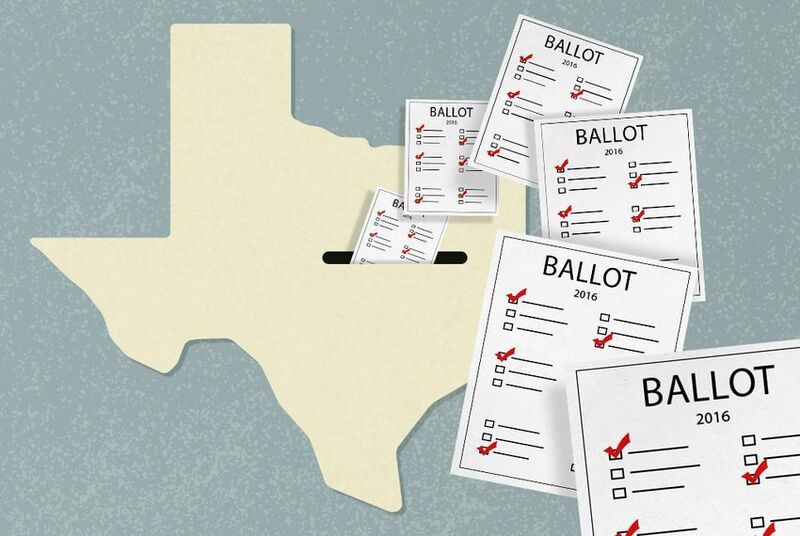 Gilberto Hinojosa, Texas’ Democratic Party chairman and an opponent of state’s ID law, said Republicans are too focused on voter ID and “turn a blind eye” toward election fraud by mail-in ballots, which is more prevalent in the state. “When you suppress the vote by this made-up boogeyman that (Republicans) created – voter fraud by voter impersonation – they put themselves in a situation to succeed in elections,” he said. Mail-in ballot fraud long has been the most prevalent form of election fraud handled by the attorney general’s office. Records from the agency dating to the 2004 primary election show the agency opened 93 cases of election violations, with almost half involving violations of mail-in ballot procedures. White signed off on the charges against the six Cameron County politiqueras in 2014 and the three more in Hidalgo County convicted this year. Most fraud accusations are referred to the attorney general by the secretary of state’s office or local law enforcement agencies and prosecutors. Cases prosecuted locally in any of Texas' 254 counties are not included in the News21 analysis because no one agency keeps the information statewide. She built relationships and talked about the candidates with residents at local adult day-care centers. Before long, residents would receive their ballots in the mail, and Verino could count on them to call her. Brownsville attorney Carlos Masso, who represented one of the women in court in an earlier 2010 voter fraud case, said politiqueras aren’t as active in Cameron County since the arrest of the six women. Texas State Rep. Eddie Lucio III, a Brownsville Democrat, represents parts of the Rio Grande Valley, which is made up of four counties at the southernmost tip of Texas along the border of Mexico. He was born and raised in the area and said he has never had problems with politiqueras because mail-in ballots were never a deciding factor in his elections. “I have never seen or experienced things,” Lucio said, adding that it’s not exclusive to border towns. Mary Helen Flores disagrees. She founded the Citizens Against Voter Abuse in 2010 after she realized candidates could lose a local election in Cameron County because of the effect ballot harvesters had on the mail-in vote. “These politiqueras would go to this vulnerable population and under the guise of assisting them, would tell the voter, ‘Well, I’m going to help,’” Flores said. Flores said mail-in fraud had been a way for voters in the Rio Grande Valley to skirt the requirements of the voter ID law. “When you vote by mail you don’t need to show proof of ID, so there’s one less safeguard to prove that it’s the actual voter that’s voting,” she said. Her group conducted its own investigation of the six Cameron County women and gave their evidence to federal agents. “We documented everything very well and all that evidence was then turned over to the FBI,” Flores said. One year after the women were arrested, the attorney general’s office turned to the city of Weslaco in Hidalgo County, west of Brownsville. Letty Lopez, a Republican candidate for Weslaco City Commission, who lost her election by 16 votes, challenged the results, saying politiqueras improperly submitted older voters’ mail-in ballots during the November 2013 election. “Citizens of Weslaco, their elderly parents or grandparents said we didn’t get to fill out our ballot,” Lopez said. Martinez told investigators that Rivera assisted him in filling out the ballot, but he did not see how other candidates were marked. As promised, a load of “caliche,” or gravel, was dumped in his alley after he voted. Three years later, potholes are starting to form. Letty Lopez finally took over as city commissioner after she defeated Rivera in a special election in November 2015. Rivera was later charged with 16 election violations and pleaded guilty to one charge of unlawful assistance to a voter in July. A report by UCLA professor Matt Barreto and University of New Mexico professor Gabriel Sanchez found that Latinos were 2.42 times more likely than whites to lack the identification required under Texas’ voter ID law. That creates a barrier to voting among Latinos, Brent Wilkes, executive director of the League of United Latin American Citizens, told News21. Texas Latinos make up the second-largest Hispanic statewide eligible voter population, behind California, according to a study by the Pew Research Center. The study also found one-third of Hispanic eligible voters in the state are between 18 and 29. In the small West Texas town of Rocksprings, a predominantly Latino community with a population of 1,400, Edwards County sheriff’s deputies diligently reach out to voters they think shouldn’t be voting in local elections. Its sheriff is Pamela Elliott, a conservative Republican. The Edwards County sheriff’s office has charged two voters with voter fraud since 2012, according to records provided by the attorney general’s office. Given the small number of registered voters, this puts the per-voter rate of election fraud allegations ahead of every other county in Texas. None of those cases involved voter impersonation. Elliott said she brought three more cases of possible fraud to the attorney general’s office in August. One of those allegations involves Reneé Gallegos-Johnson, a Rocksprings native who now lives in Louisiana. She still owns a home in Rocksprings and continues to vote in the municipal elections there because she says she cares about the issues in the town. She is registered to vote only in Texas, so she was surprised by a letter from the sheriff’s office asking her to explain her reason for voting in Rocksprings. “When you vote in the city election but don’t live in the city, you may have friends here, but inherently any of those decisions don’t affect you and that is fraud,” Elliott told News21. Gallegos-Johnson spoke to secretary of state legal counsel and verified she could vote in Rocksprings under Texas’ residency laws. She thinks the sheriff is targeting her and a handful of others in the town and using her office to intimidate voters. “I do believe that I’m not part of her group,” she said. “One, I’m not part of her clique, and two, I’m a Gallegos."